When I use my credit card to buy a sandwich at my favorite deli, I receive an email. The deli uses a rewards service offered by Spring. The automated emails, sent immediately after each purchase, include a graph that illustrates just how close you are to your ‘free’ $10 gift card. It’s silly, and hardly removed from the ’10 punches on a punch card gets you a free sandwich!’ of old. But honestly? This little graphic really does help ensure that I return to that deli: Yes, this graph suckered me into buying more sandwiches. This visual has successfully burrowed its way into my head whenever I’m contemplating my lunch plan. I usually keep my eyes open for sales tricks, I really do. But that deli caught me with that one. And I’m sure I’m not alone; it’s a well-devised new spin on a classic tactic. Such targeted, web-driven information is only in its infancy. But countless advances are made in this field every day. The marketing and sales applications for web-based, targeted promotions is advancing particularly fast. iBeacons, an Apple-specific offering, represents one noteworthy new means through which these tactics will be put to use. 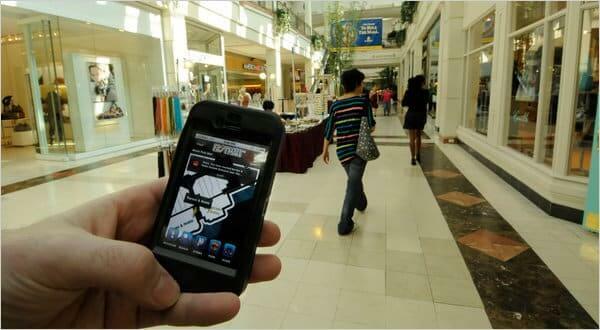 More information about iBeacons and similar technology is available here, if you’re curious: iBeacon. But here is a general overview: iBeacons (and a number of comparable technologies) allow companies to market directly to your cell phone. MLB ballparks are an early adopter of this technology. If you’re at an MLB game, iBeacons can already market to you based off exactly which participating food or beverage vendor you’re standing nearest. This is just one early example of this new form of targeted marketing is already being put to use. It should go without saying that this is immensely powerful technology, particularly for owners of brick and mortar stores, who depend on catching the attention of foot traffic. 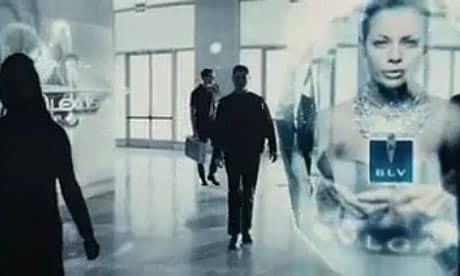 It all reminds me of a scene from the 2002 movie Minority Report, in which targeted advertisements are beamed directly into the contact lenses (Google Glass, anyone?) of the protagonist as he walks through a ‘futuristic’ mall. (Not really so far-fetched, was it?) But, overwhelming and controversial as these emerging technologies may be, business owners would be remiss to ignore them. I recently read the following article by Don Peppers: If I Ran a Brick and Mortar Retailer. Mr. Pepper’s own assessments made me think about my favorite deli’s evolving sales techniques. More than just sandwiches and graphs, this article had me thinking about the thousands of business owners seeking assistance with their own unique web-based projects. Owners of brick and mortar storefronts are increasingly depending upon e-commerce and we-based marketing solutions that are highly customized to drive their store’s bottom line. Indeed, the central problem Mr. Peppers lays out–brick and mortar storefronts trying to compete in the age of e-commerce and web-based marketing—is one of the main needs addressed by web developers today. Several years into this evolution, many brick and mortar businesses, including small to medium sized businesses, are leading the way in web-based innovations. Owners and stakeholders of small business continue to seek out their own brand of custom solutions that have proven to, sometimes dramatically, deepen customer engagement. My favorite deli, and their software partner, are just one such example. Of course, retailoring an existing business model to allow for more web-driven services can be extremely laborious, not to mention costly. It’s certainly true that the long term result of such integrations can be a marked increase in revenue, but the up front cost involved can be a bitter pill to swallow. A 1 or 2% decline in revenue, year over year, is a concern for any small business. But it’s rare that relatively modest declines will lead a business owner to take drastic action. In fact, investing thousands of dollars into restructuring a business to incorporate e-commerce and/or social media functionalities might be the last thing on the mind of a struggling small business owner. Unfortunately, such inaction can be a part of the reason many of today’s brick and mortar businesses go under, even if they are slow-sinking ships. Business owners need to keep a sharp eye out on emerging technologies like iBeacon and the software utilized by my favorite deli. More than this, business leaders, particularly of brick and mortar storefronts, need to start thinking about how these technologies will continue to converge. A website may not be your business’s marque storefront, but it’s the storefront with the largest potential customer base. And more and more, e-commerce and web-based tools are becoming an expected means for small business to deepen their connection with their customer base. Fortunately, web development firms continue to strategize with business owners every day. In many cases, a short consultation with a web developer can lead the way to a more competitive business. But simply meeting with and paying web developers is not a solution. Pay attention to exactly what these web developers say. Be sure that the agency takes the time to truly get to know your unique business model, and exactly how web-based solutions could best affect your business’s bottom line. As always, with new challenges come new opportunities. Staying vigilant and on the forefront of emerging technology is of paramount importance for business owners. Exactly how each business utilizes these innovations requires thoughtful, customized solutions. One thing is certain: I don’t keep punch cards in my wallet anymore.